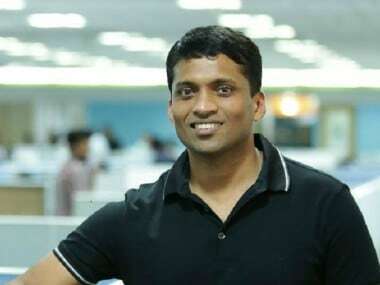 New Delhi: Online education start-up Byju's on Monday said it has raised $540 million (Rs 3,865 crore) in funding, led by Naspers with a significant portion also being contributed by the Canada Pension Plan Investment Board (CPPIB). The new round of funding will drive innovation for tech-enabled learning products and also fuel plans for international market expansion for Byju's, a statement said. "We are happy to have prominent and long-term partners like Naspers and CPPIB on board with us. This partnership will strengthen our ability to deliver on our vision to build the world's largest education company," Byju's founder and CEO Byju Raveendran said. He added that while near-term profitability is important for the company, its main focus continues to be on long-term sustainable growth. While Byju's did not disclose the valuation of the company, industry watchers estimate it to be over $3.6 billion (Rs 25,763 crore). "The ed-tech industry is undergoing massive shifts, students today want to learn through engaging and interactive methods. We are pioneering 'better learning for tomorrow' with technology as an enabler, and have been working towards making students active learners," he said. Launched in 2015, Byju's has 30 million students cumulatively learning from its application and over 2 million annual paid subscriptions. In June this year, Byju's had said it has crossed Rs 100 crore in monthly revenue and had revised its revenue targets for this year to Rs 1,400 crore. Last year, Byju's had announced raising an undisclosed amount in funding from China's Tencent Holdings and Belgium-based investment firm Verlinvest. In 2016, it had raised $50 million (about Rs 332.3 crore) from a clutch of investors, led by Chan Zuckerberg Initiative (CZI) and Sequoia Capital. To date Byju's has raised funds from Naspers, CPPIB, General Atlantic, Chan-Zuckerberg Initiative, Tencent, Sequoia Capital, Sofina, Verlinvest, IFC, Aarin Capital, Times Internet and Lightspeed Venture Partners.